Here are some of my collection. Suffice to say it is still growing. 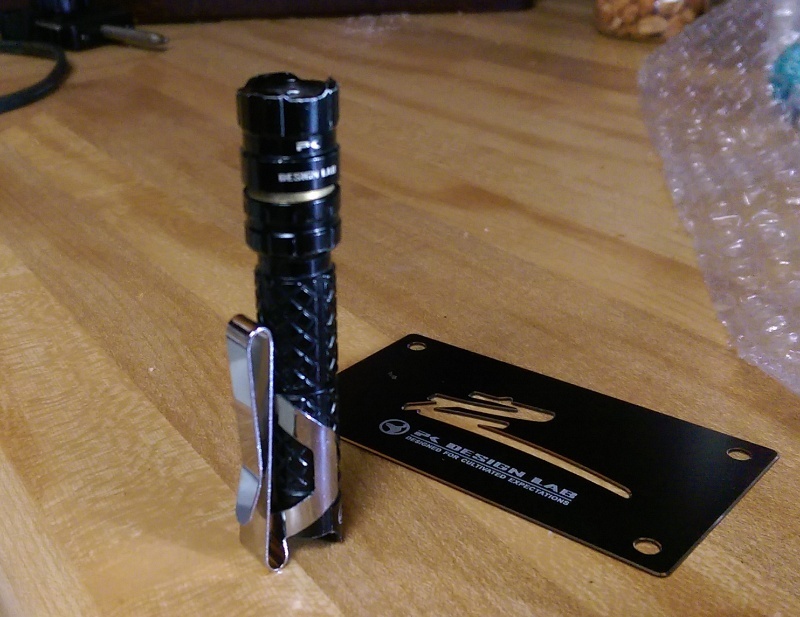 A SureFire G2 rechargeable conversion kit. All of these arrived one day. That's it for now.... that is about half. The good book tells a story of David vs Goliath. History shows it took a few stones to complete the task. Hence all those 'stones' on the bedside table. Now a few of those vintages I restored from non working, some arrived like new. And it all began with a Coast HP7 my wife confiscated. I needed a brighter light than my incan mini mag at work one night. I went to a nearby Lowes and bought an HP7, Energizer Hard Case and a Lux-Pro... the collecting began that night. Just scored a minty Stewart R Browne F-81x with less than a minute to go. A WW2 era, Army issue light that was used in places where static electricity could ignite a bunch of fuel. Miners, gas and oil pipe workers, phone company workers in manholes, railroad yard workers, pilots, and lots of other intrinsicley safe uses were met by the F-81x. The Navy version has USN on it where this one has US. Stewart R Browne lights are in the Smithsonian in a "first plastic flashlights" display from stuff Mr. Browne was using way back in or about 1918. The company still exists today. 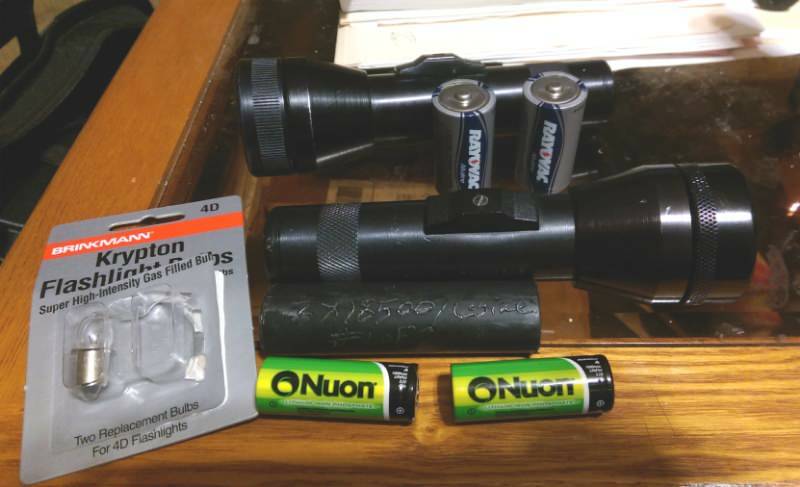 Also recently scored a Laser Products 6R, which was the 6P with a rechargeable battery. These were reportedly nowhere near as popular as the 2 cell version but that means they are rare... and cheap. I managed to score a GT Price Smoke Cutter for less than the shipping cost. Formerly a company called LA Screw made these lights that contained a 're-reflector' setup and some other proprietory tech that aided a fireman in a burning building. In time famous for their TL-122 and MX-991 light maker GT Price acquired LA Screw. Reportedly later Don Keller acquired GT Price and rekindled Kel-Lite briefly with some 2x AA lights. 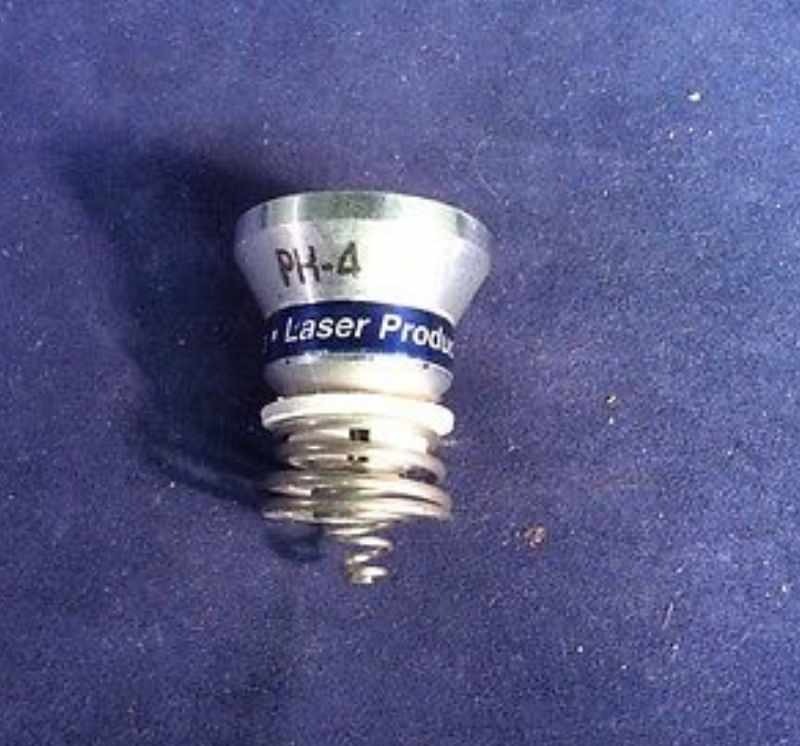 A genuine LA Screw Code 4 3+2= 5D with a never produced in mass toggle switch. 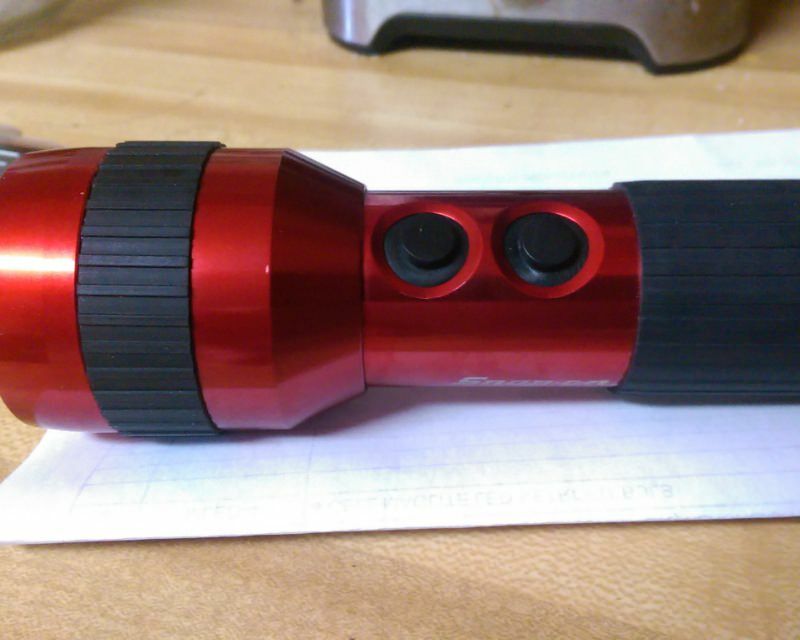 LA Screw used a switch assembly that could be placed between barrel segments for better balance on the longer lights. GT Price designed a no "click to on" toggle switch that had LA Screw distributors say "not no but hellno!!" so it never went into serious production. 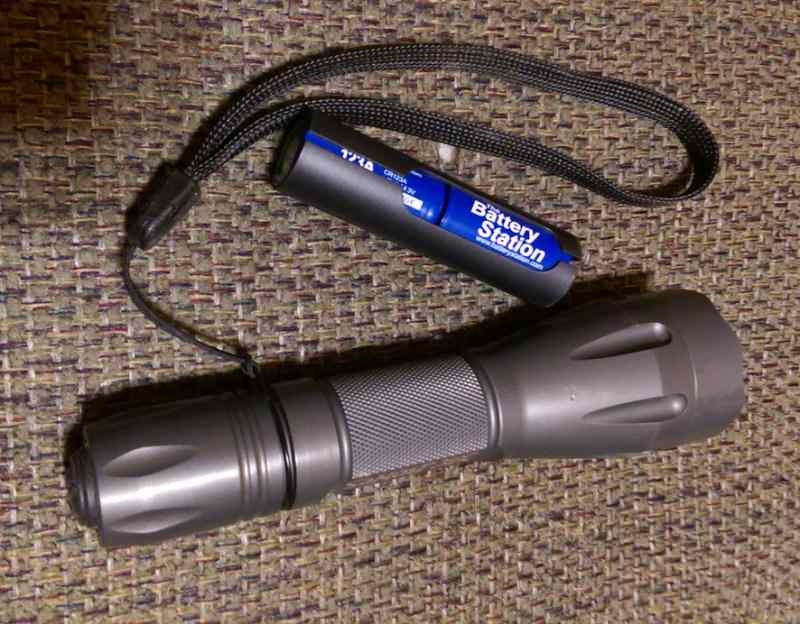 Next to the green Mag is a 4D Streamlight made from the 3rd generation Kel-Lite design shortly after Norm Nelson sold Kel-Lite designs to Streamlight to pay off debt... 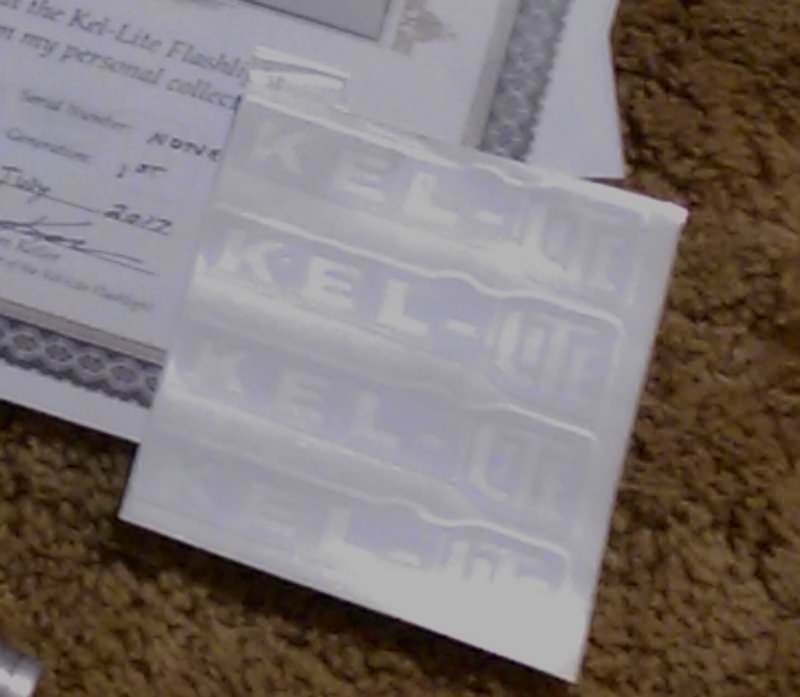 Norm was hired by Don to help get the company out of debt and at one point ended up running Kel-Lite so founder Don Keller left in 1973. Streamlight had the resources to keep up. Meanwhile Tony Maglica was making some over flow stuff for Kel-Lite and Bianchi B-Lites. He was a shrewd man who had been making stuff for the US government and had acquired a stellar reputation as an exellent, dedicated machinist. 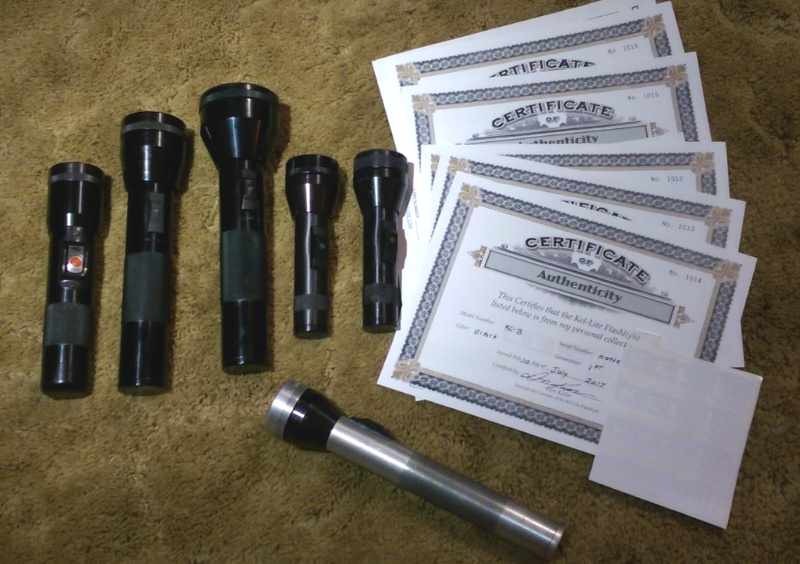 When Mag Instruments was founded in '74 Tony was ready for the task of making flashlights. He also had the know how to produce much of the machinery required. 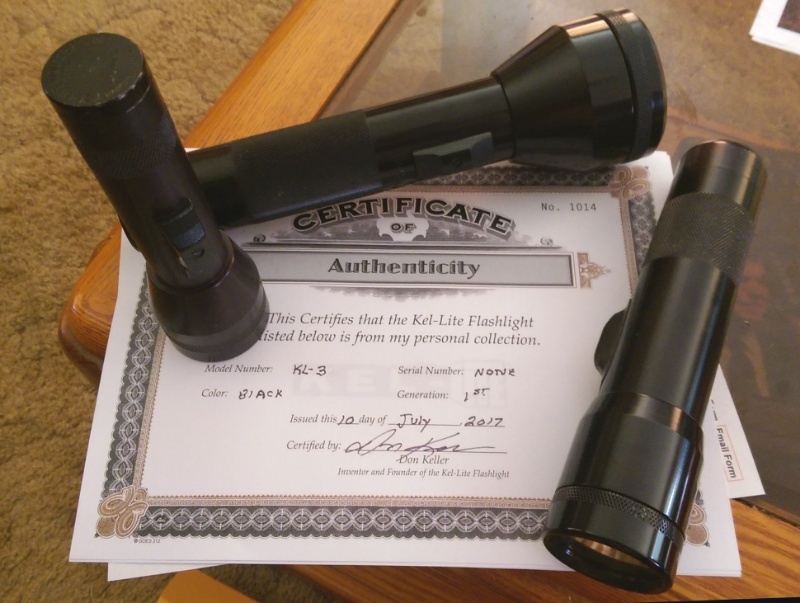 So with flashlight veteran Don Keller along side Maglite changed the world of flashlights by 1979. 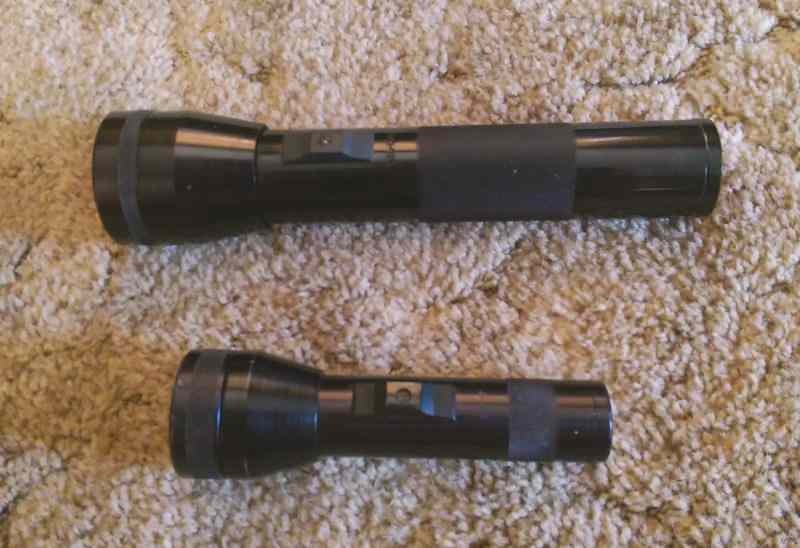 The photo shows that parts of early Maglite and Kel-Lite stuff could be interchanged. 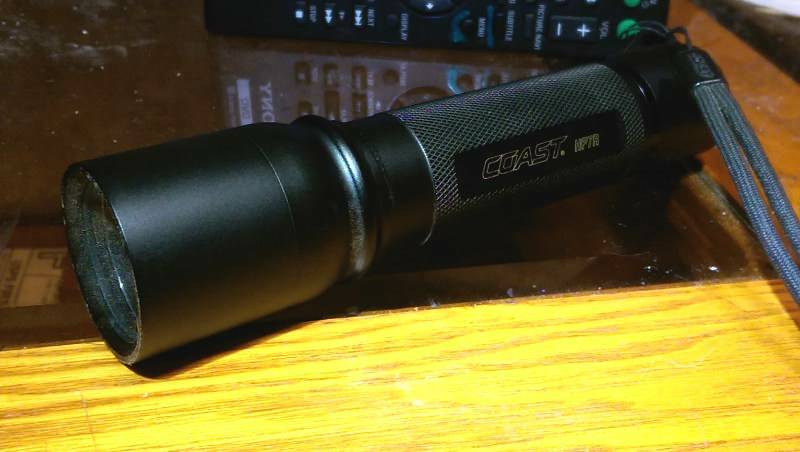 It also shows Streamlight made in both Pa and Ca. 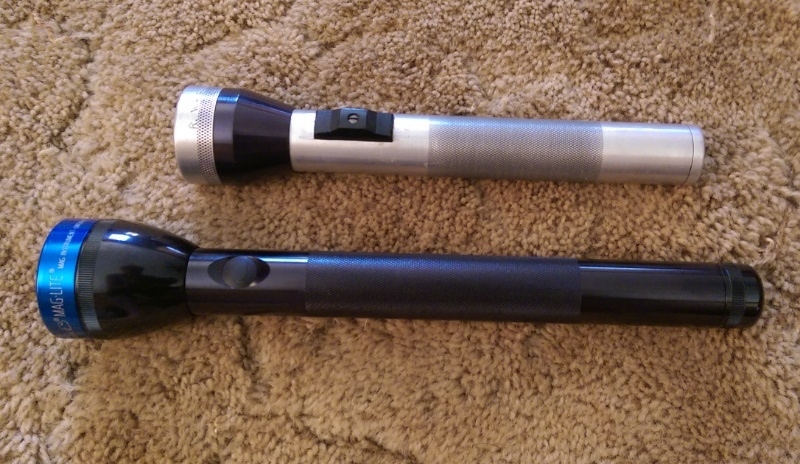 Don went to Brinkmann and developed a bunch of lights after parting ways with Maglite. The pair shown are low production numbers being an Eddie Bauer promo 3C and a gold plated 3x AA executive model. Only made for about a year, this was the answer to the minimag folks were begging for. Clicky tailcap so their favorite beam could be saved or stealth tactics could be used with one hand. Even more rare Sigmalite bulbs. A pair of Justrite aviator lights. Top is WW2 issue and bottom is Korean Conflict era. 2x AA lights using #222 or #224 bulbs and a sliding device which slides a red cover over the bulb. Both have a signal ability or full time on/off. 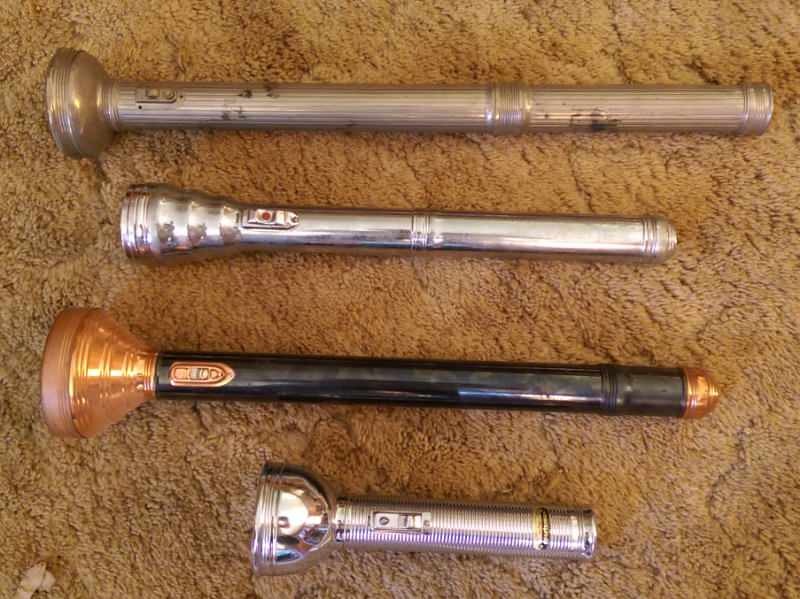 The top one is an alluminum tipped Stewart R Browne Tuffite body with a pocket clip sliding switch. The bottom is all alluminum with a twisty tail cap switch akin to 1990's 2x123 cop lights. 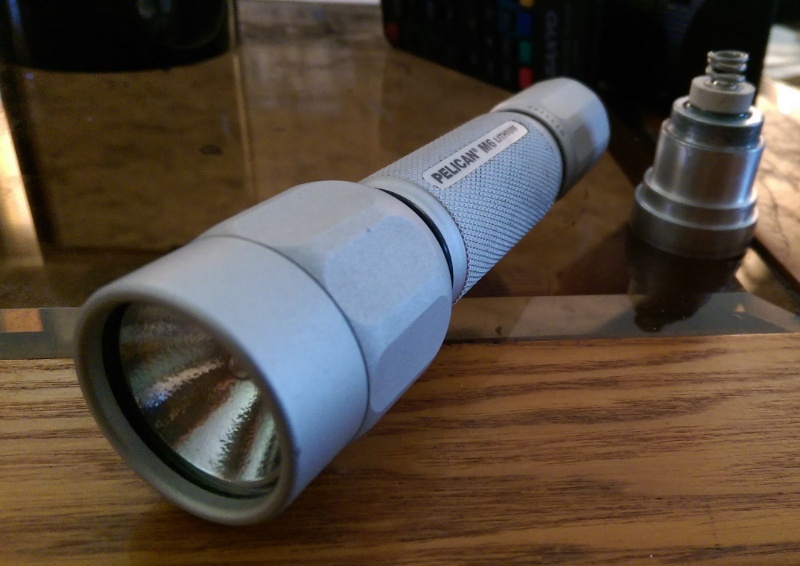 The Pro-Light Phaser Lights PLC20 rechargeable. 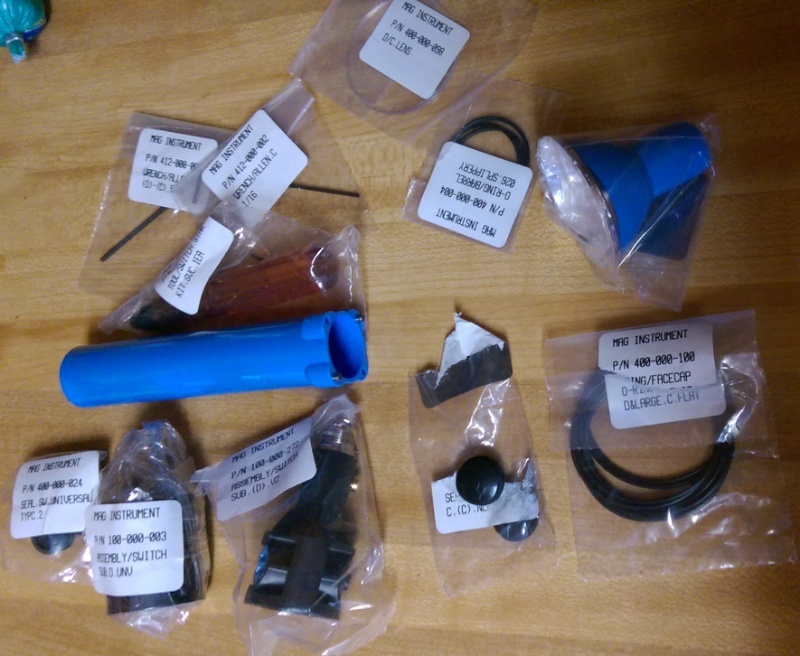 All plastic except for the reflector module that strongly resembles the early Streamlite SL20. The Bianchi B-Lites 2D. This little heavyweight throws a pencil beam like it was shot from a rifle while providing tons of spill. And an nip switch assembly. Wow! Fantastic information! Thanks for sharing. I like it a lot Johnnie. It arrived with nearly all of the chrome gone from the clear plastic reflector. 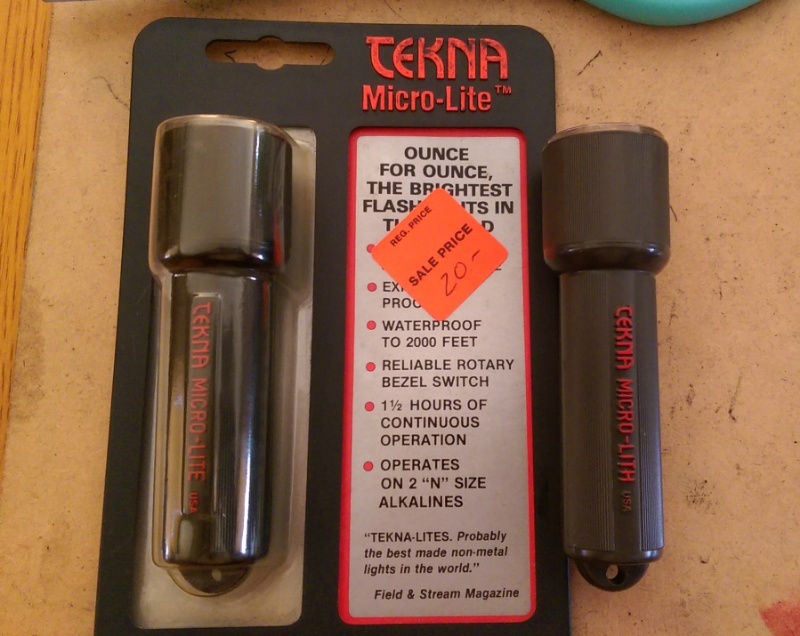 I thought I was stuck with a room lighter with only a slight bit of throw unless I invested in some kind of re-chrome materials. 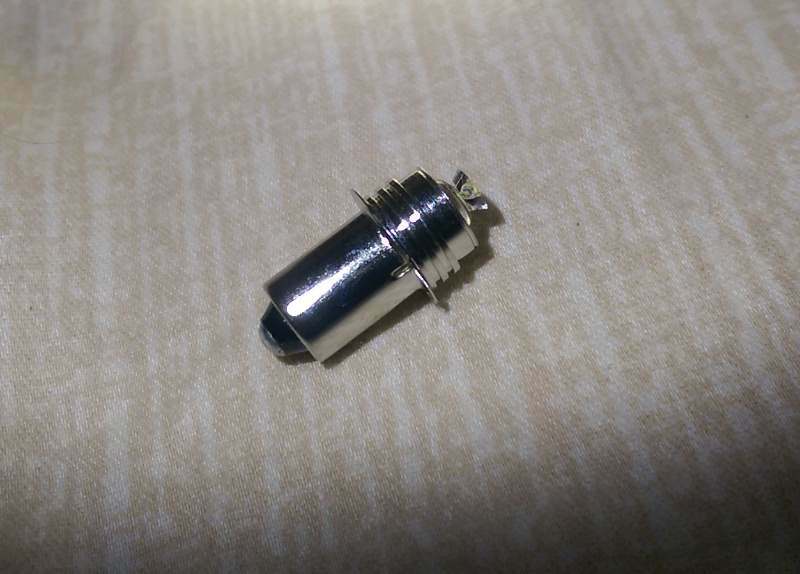 Well I lucked up and found some new parts for LA Screw lights including a metal reflector made by Qualtech back then. 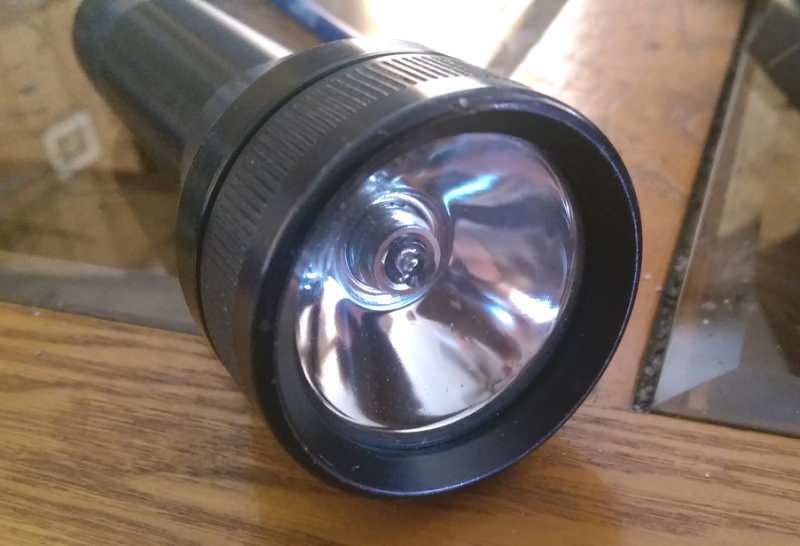 I noticed the like new reflector in the LA Screw light looked awfully similar to that B-Lite reflector that I had painted white (to boost the throw a bit). Lo-n-behold it was the same reflector!! 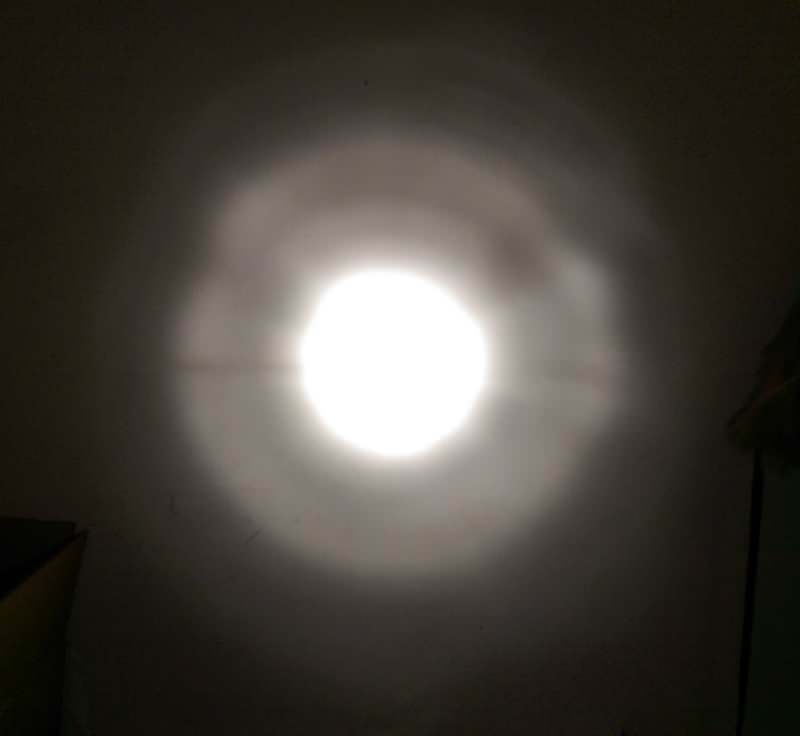 It also turns out that a Maglite lens works. 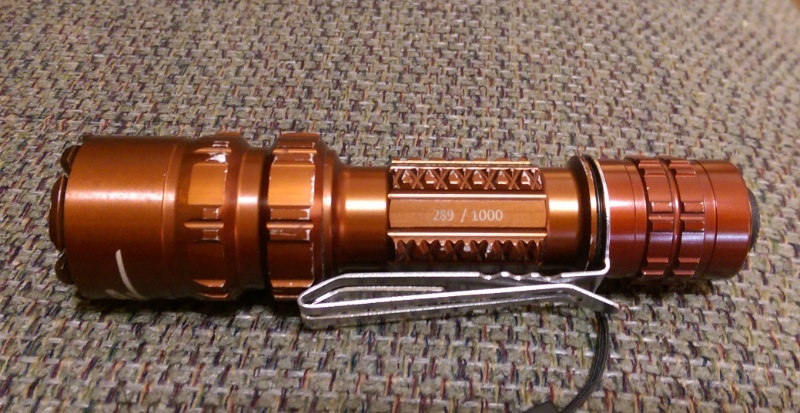 It now has a Mag White Star bulb and a flashlightlens.com ultra-clear glass lens. And it beats the pants off of my 2D Maglite for brightness and throw. Only my 4C Mag with 3 cell krypton bulb can beat it. But my favorite part was the "super star" sticker on the taiicap. I like to think it came from a policemans kid. But it was an eBay item so I don't know the actual history. 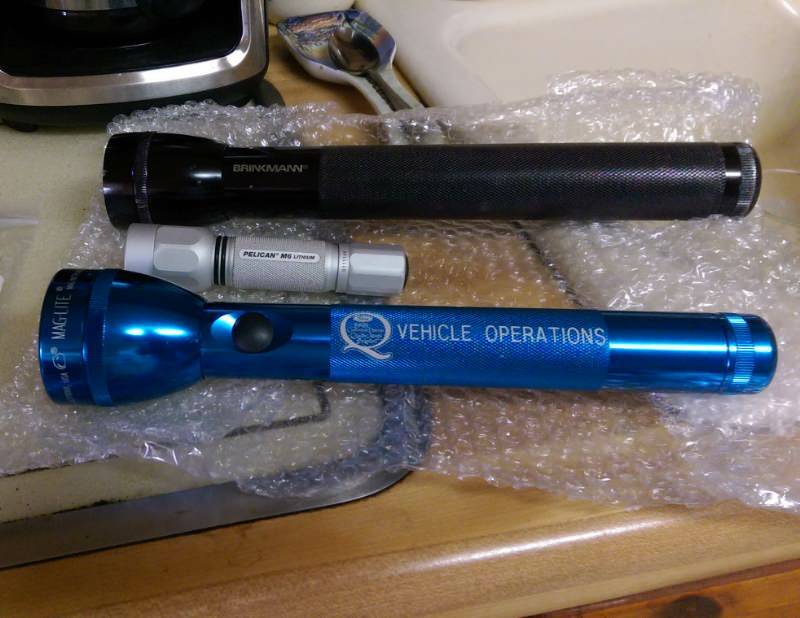 The plastic Pro-Light I showed has the officers badge number on the bezel and the charger, while that Sigmalite has FPD engraved from a Fresno California police mans estate. My appologies for all of the pix being gone. Photobucket decided to charge users nearly $40/mth to allow them to be viewed. Not gonna happen. When I find a viable alternative they will be replaced. 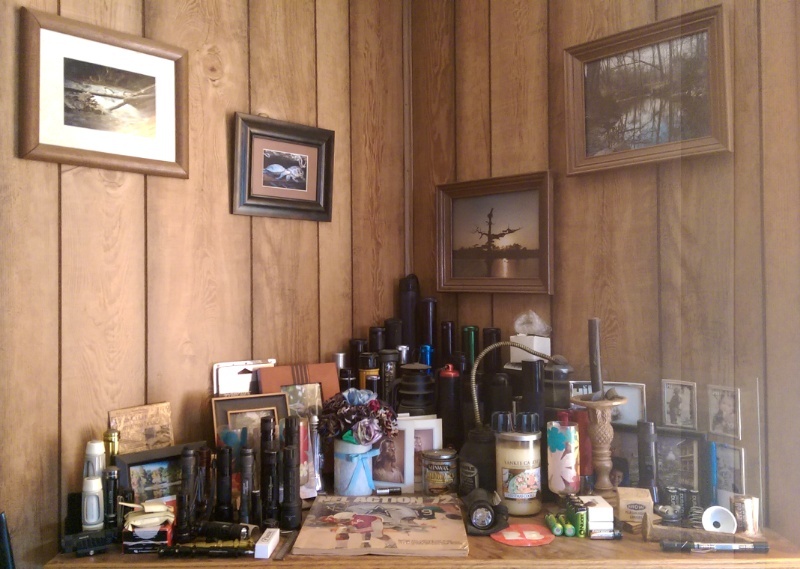 Here's a couple few from my den. Incans, LED's, new and old. Ages from 1911 to 2017. Custom white reflector bottom left is for turning some into close quarter tactical flood only lights. Rechargeable batteries for hot wired numbers. 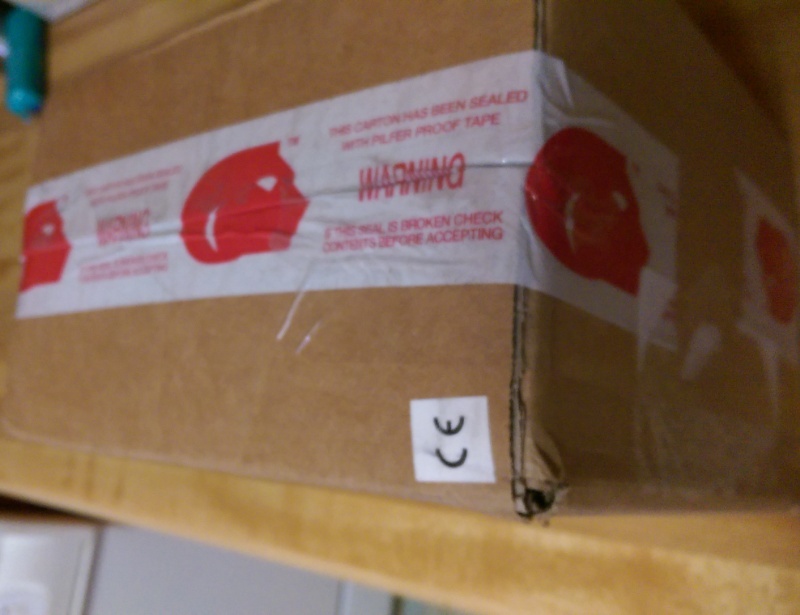 Once the Pony Express gets a few more delivered there'll be unseen gaps in the photo filled. 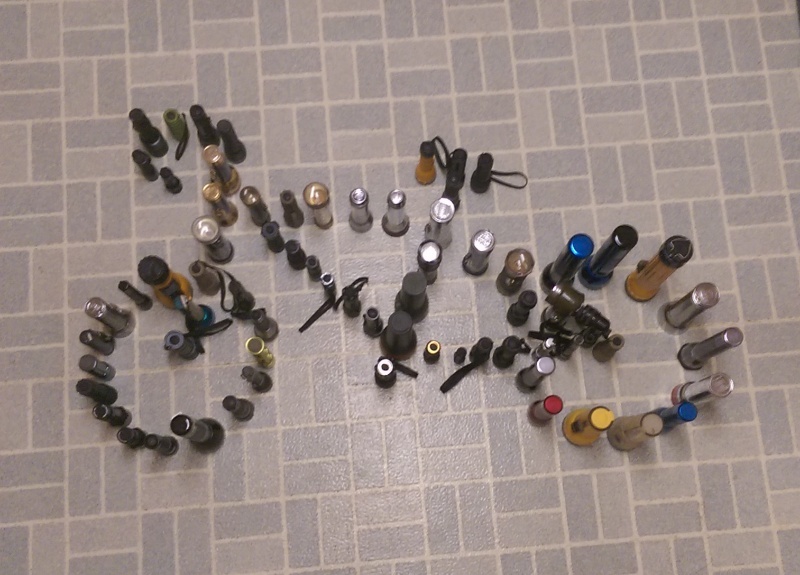 Also unseen is extra barrels to change some into different cell'd (even brighter/longer) numbers lickety split. Lots of repair parts too. Unseen gaps will be filled soon with more incoming. Added the first LED in a while. 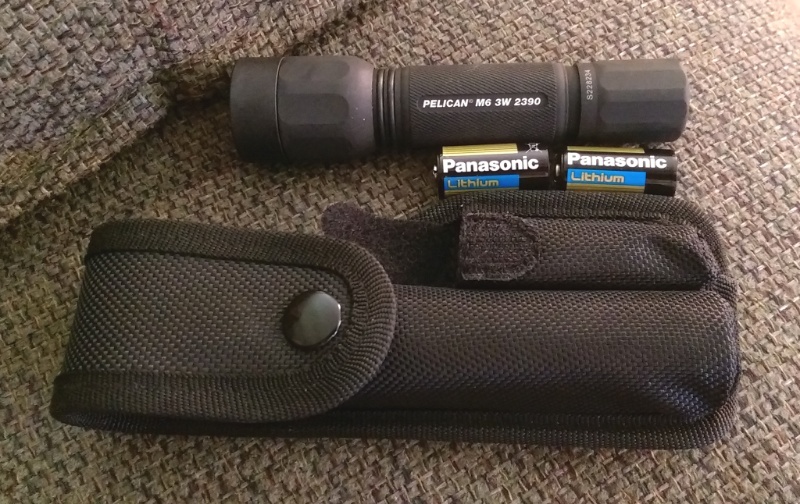 Minty Pelican 2390 with original batteries from 2008. A silver 2320 is scheduled to arrive soon. awesome! 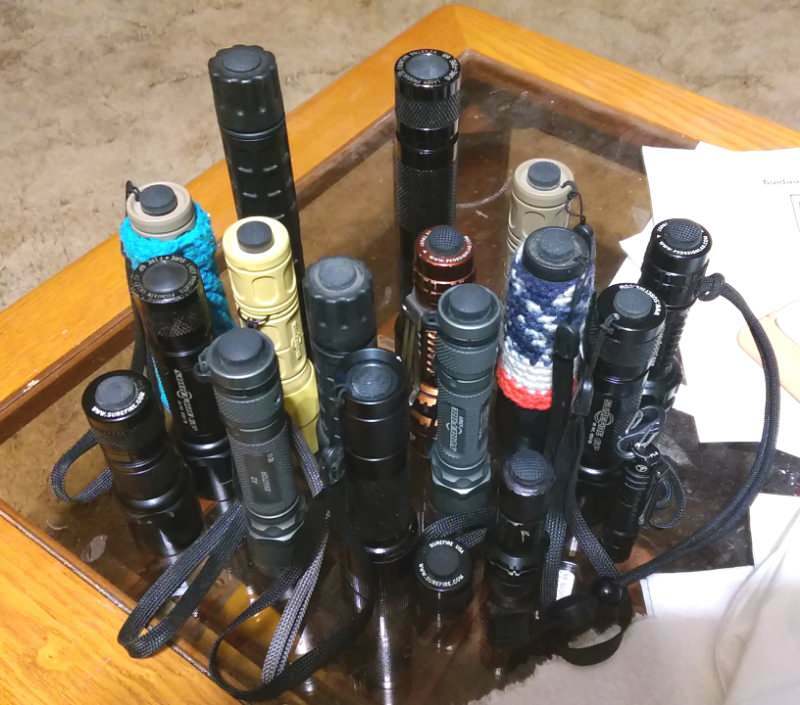 !both of collection is classes, so would you buy some new version outdoor led flashlight?？some of then belongs to the mini led flashlight. Now that the pix are back maybe that'll help answer the question. 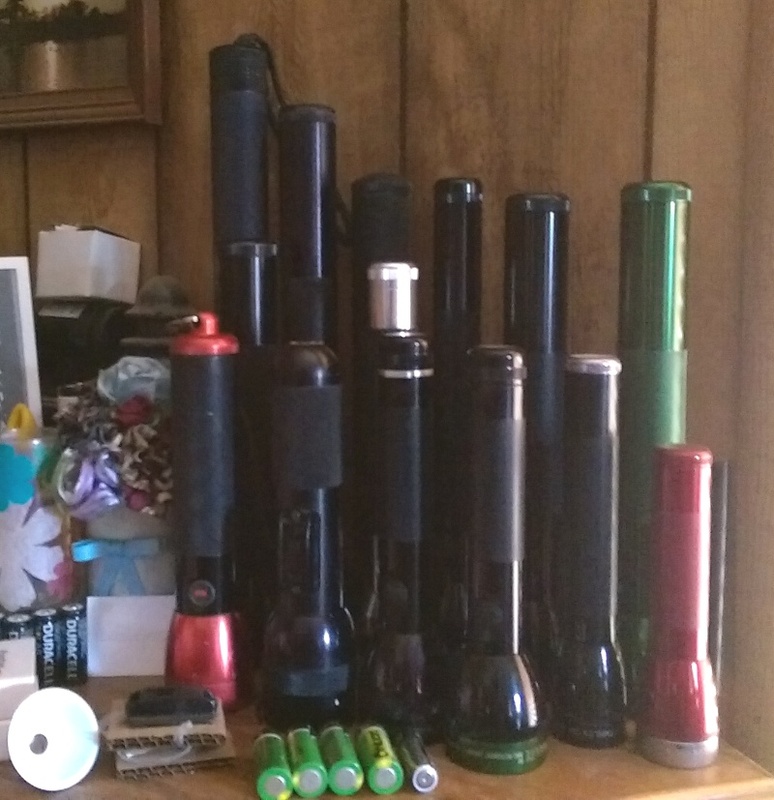 I have lots of "new" lights. But to collect those fashion of the week brightest today, replaced by brighter tomorrow cheap chinese tin toys? Nah. Brightness and all those gimmicks of 22 second turbos bore me to tears. I'd rather tweak a couple hundred lumens from a minty 1971 2C cop light. Bottom a 90's 4C Mag using a 3 cell krypton bulb to pump out extra photons. 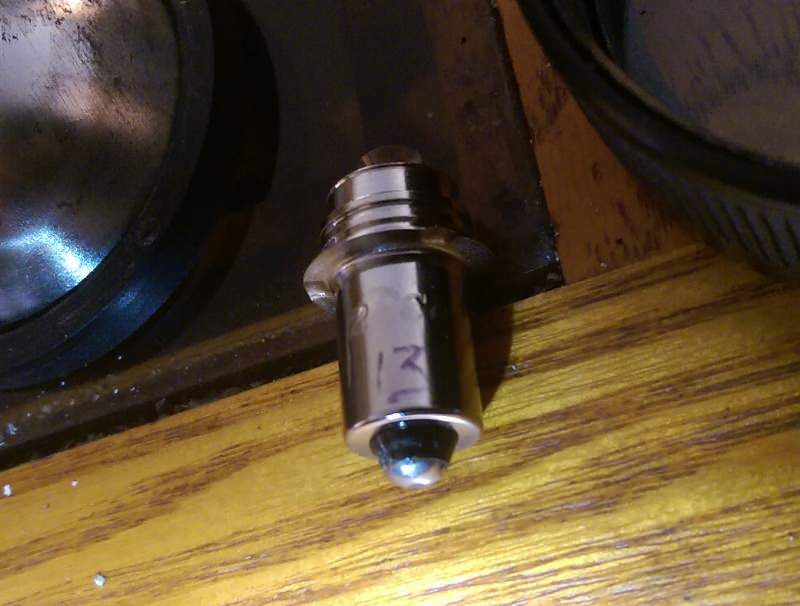 LA Screw Smoke Cutter head and tailcap on a Code 4. Contrary to popular belief the P60 fits early M6's just fine. SureFires, Icons, PKDL's, Maglites, Pro-Lights, Streamlights, LA Screws, Kel-Lites, a B-Lite, Brinkmanns and some spare parts on display. Probably other stuff too. Don built 10 1st gens with a medium head for a movie producer and 1 for yours truely. Mugen edition. The only one. eBay seller had sets of 20 of these for $25. Lights on left have certifications that they came from Don Kellers collection. The silver one came from an auction. Only 5 sheets of 4 stickers each were produced. Coming soon, a 2D BrinkmannLegend Snap On edition that was never produced. Only 6 samples were made. 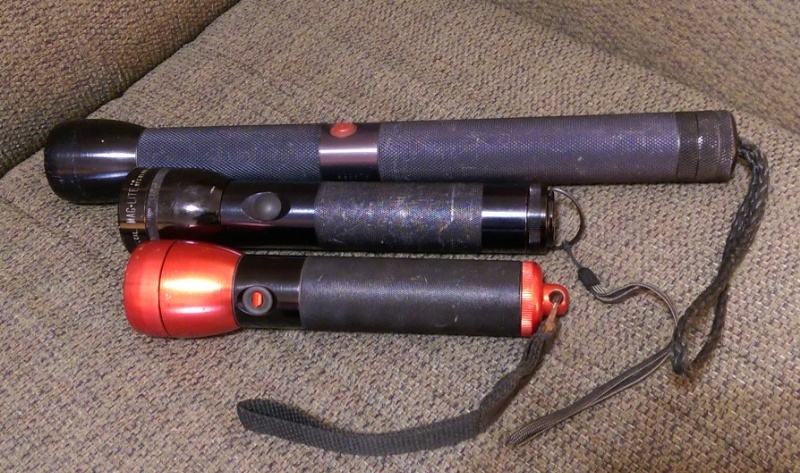 And some Maglite drop in modules designed by Don Keller before Maglite had any LED lights available. wow!amazing collection! 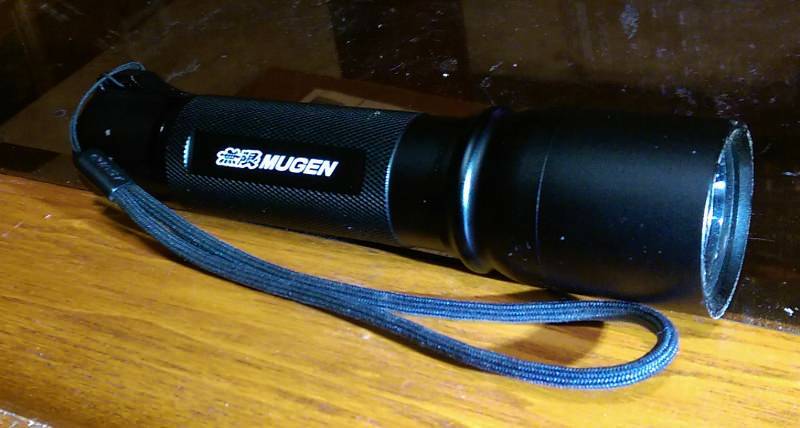 !many classes products included!but if you're interested in the new version led flashlight, seems like 90° outdoor led torch, just have a look!! It was reported that 5 were given to Snap On folks to evaluate and #6 was stashed. 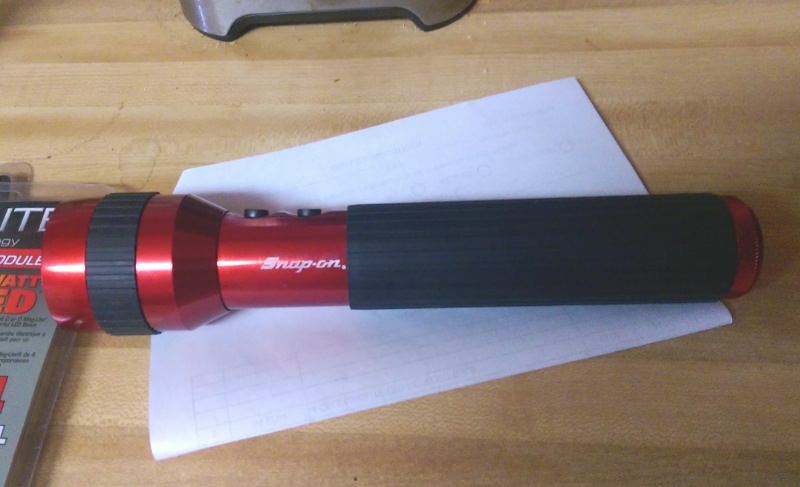 Snap On said "no thanx" so no more were made. Has a high switch and a low switch. 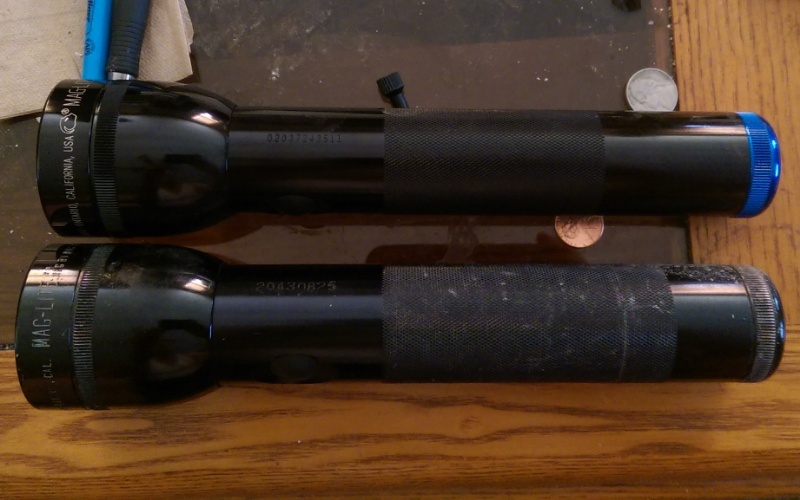 Focuses like a Maglite with a Brinkmann twist... better shaped reflector for max spill without the hole while still preserving a nice spot when adjusted to flood mode. Irony? 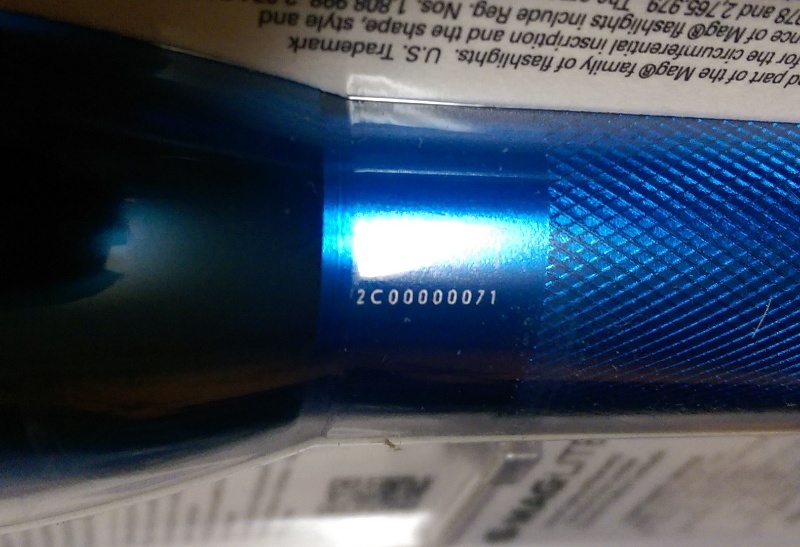 It came with a Maglite bulb in it. 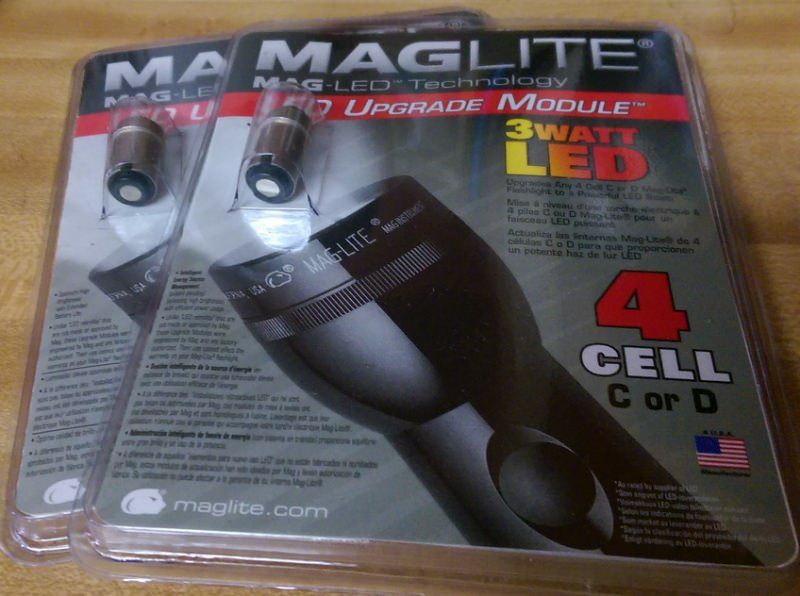 Once upon a time Maglite made drop in modules. Circa 2006 Mag made drop in modules to double the brightness of a 4 cell light and drastically increase runtime. I managed to score a few. New in Box 3D B-Lite by Bianchi.